Established thirty years ago, Hornell area Transit is dedicated to providing quality and reliable transportation services to our clients. 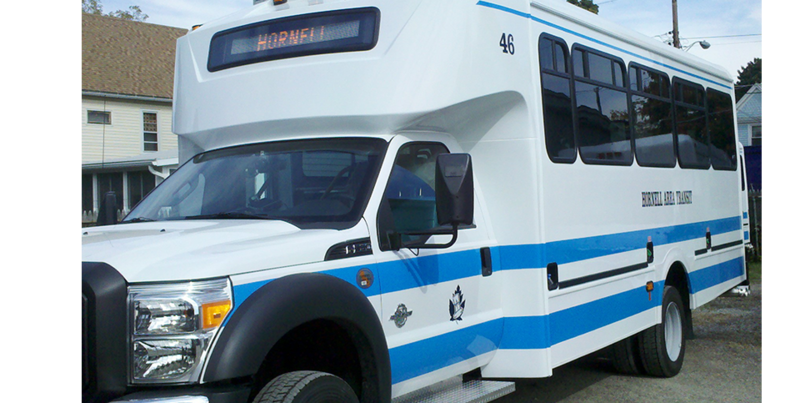 Hornell Area Transit is a Public Transportation service sponsored by the City of Hornell for residents of the city, and surrounding areas. Our drivers are courteous, fully licensed and insured. Public Transportation is an open to the public service available for a modest fare, to anybody who would like a ride. Our vehicles are equipped with 2-way radios for communications, public address systems, high-end stereos, most of our buses have bike racks for your convenience, and ALL are wheelchair accessable. Our buses have both front & rear A/C & Heating Systems for your riding comfort. 511 Trip Planner Coming Soon! 511NY is New York State's official traffic and travel info source. Taking public transit is safe and reliable, soon you will be able to go to our trip planner in links section of this page to start planning your trip, or simply dial 5-1-1 on your phone. Wherever you're going, 511NY is here to get you there. We are closed the following holidays: New Years, Memorial Day, 4th of July, Labor Day, Thanksgiving and Christmas. Think of us next time you need a ride.